One of my favorite aspects of playing with stitches is the resulting sample cloths that are peppered with a variety of color, stitch trials and errors, and other random bits of embroidery. While preparing for summer embroidery classes for kids, one necessary item in each kit that we prepared was a blank piece of fabric, 10″ square. These pieces were linen of various types, pulled out of my stash, cut, rinsed, pressed, and surged along the edges. Their purpose is to give the kids a decent piece of fabric to practice on, so that they can master individual stitches before applying them to their projects. As we were preparing the classes, I noticed that one of us called the piece of fabric “sampler fabric” and the other called it “a doodle cloth.” In class, we find ourselves each using our own pet term. There’s a slight difference between a sampler and a doodle cloth, at least when it comes to concept, especially considering the way the term sampler has developed throughout the ages. Technically, a sampler and a doodle cloth really aren’t that much different in concept. 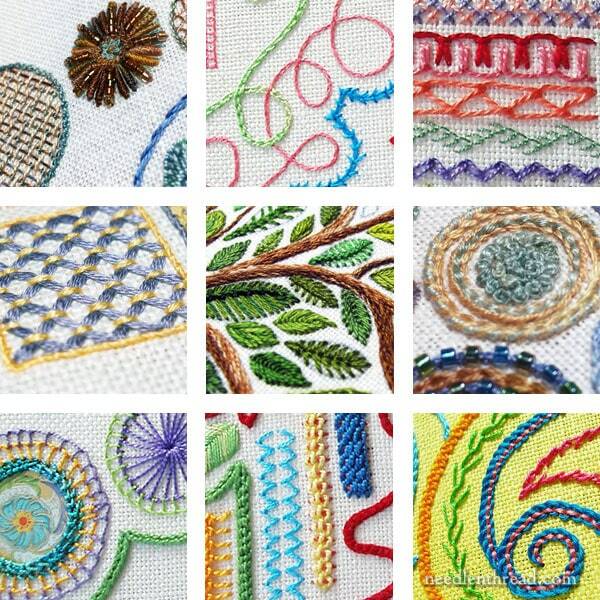 A sampler is just a collection of samples of stitches and techniques. But over the years, the sampler has become synonymous with a piece of work that has some kind of purposeful organizational structure. A doodle cloth rarely has any considered organizational approach. It’s just a cloth that you practice on randomly. You find a blank spot on the piece of fabric where there’s enough room to try out a stitch or technique, and once you have it down, you usually switch over to the project you’re working on, where you apply what you’ve learned to whatever you’re stitching. In this article here on damp stretching and blocking embroidery projects, I used a doodle cloth to demonstrate how to damp stretch and block fabric. There’s absolutely no structure to the stitching. I was doodling stitches to photograph how they are done or what they look like when they’re finished. I had absolutely no organizational approach in mind, and I just squeezed in stitches in spaces available. The resulting piece of fabric, covered with stitches, might be fun to look at, but it doesn’t really fit the notion of what we consider a sampler today. When we hear the term “sampler” today, we normally think of a piece of fabric with rows of stitching, often counted; maybe a border, maybe some spot motifs, sometimes a house and flora and fauna; and then, often, some kind of alphabet or verse – and normally signed and dated. It is something that is kept; it is a clear record of progress or a demonstration of a specific set of skills. Yet, a sampler can go beyond this concept, too. The leafy tree you see in this article, for example, is a sampler of sorts. The purpose of it was to sample different stitches for embroidering leaves, all contained in the layout of a contemporary tree. This floral silk shading sampler pattern comes from a design that was purposely drawn so that the stitcher can “sample” different methods of working silk shading. In a needle arts class I taught years ago to high school students, this spot sampler was our learning playground, but we approached it with a specific thought for organization, so that the students could document progress and refer back to the sampler for specific information. The swirl sampler and the random stitch samplers shown in this article both have a definite design layout and purpose. The purpose of the swirl sampler was to demonstrate certain types of line stitches. I started with a pattern on the fabric so that the result was something a little more organized to look at it when finished. The random stitch sampler was meant to document a variety of stitches, which were worked with specific colors, thread types, and layout in mind, for photographing. This lattice sampler started as a rather jumbled design, but the stitches aren’t entirely random. I planned which stitches I wanted to use as I went along, and I worked with a specific color scheme. This drawn thread work and whitework sampler is somewhat random in layout due to the small (and sometimes large) spots of stitching here and there, but it was intended to record a specific variety of techniques in a clear enough layout for photographing those techniques. This circle sampler is a more modern approach to sampling stitches and techniques. It involved an organizational structure of large and small circles, specifically arranged, and a particular color scheme and collection of threads, chosen on purpose. I think my point here (but I’m not really sure!) is that we approach things differently, based on the names we give them. When I think “sampler,” I think a piece of embroidery with at least some sort of organizational structure to it, meant to demonstrate techniques or materials, often resulting in a decorative piece to some degree, and thought out in advance. I consider it something to be saved. When I think “doodle cloth,” I think of a scrap of cloth approached with no organizational forethought, often stitched on with scraps of thread of no particular type or color, that serves a basic utilitarian purpose. Once that purpose if fulfilled, the doodle cloth might go by the wayside, even into the bin! That’s not to say it can’t be saved or it shouldn’t be saved – I generally save mine because they make a good demonstration record to share with people when talking about specific stitches. But in the end, a doodle cloth is usually a rather messy conglomeration of complete and incomplete starts and stops, trial and error – and pretty much decipherable only by the stitcher. Use One and Keep It, Whatever it’s Called! But whatever you call it, if you’re just learning to stitch, set yourself up with a doodle cloth or a piece of “sampler fabric” and practice your stitches on the side, before applying them to a project. You’ll be much more pleased with the outcome of your embroidery projects projects if you practice first and then apply. And as you progress through your embroidery journey, building a repertoire of stitches and techniques, you’ll develop a nice record of where you’ve come from and where you’re going! That’s great! At least they get used – and I’m sure the kids love them! I think of samplers as collections of stitches or designs showing the way they *should* look. Doodle cloths show progress while learning a stitch, or experimenting with a combination of stitches or colors. Right or wrong, that’s the distinction in my mind. Hi Mary – I love your work and your blog so much – thank you for everything you share with us. I hope you can answer a question for me – I have seen a lot of crazy quilts with at least one spider and a web, also some embroideries I have seen have a spider in them. Do you know if there is a tradition to put spiders in embroidery work, and if so why? I think they probably just developed from garden elements, like butterflies or anything else. If you look back at late Victorian garden drawings, etchings, and the like, it’s not unusual to see a spider web figure into them – probably because they are lacy and somewhat ethereal, especially when be specked with dew. They also fit into the somewhat “magical” fairy settings typical of the late 1800’s and onwards. They’re pretty! Now, whether or not the spider is pretty is another question. Not one of my favorite critters in the world. Sometimes I think I’d rather incinerate a house than co-habitate with a spider! LOL! That said, I think it’s just a matter of a trend that held on as a typical design element through the ages. No critter is safe from an embroiderer’s needle! Are you going to post the pattern for the leafy tree design at some point? I’d love to see it in an e-book with the various stitches. Old samplers were often made by girls aged 8-12 and although worked on rows had little planning. You often see a sentence stitched along a row then she runs out of space and has to add letters or words above or below, they are so sweet. Also school girls were given squares as they went along creating sampler rolls that can be 5 foot long. I think samplers tell a story and should be treasured. Thanks for this article I’m in the process of starting cutwork or whitework which I have never tried before and at the moment I’m reading and researching different techniques so I’m going to set up a piece of linen to practice on as I think you need to practice this type of embroidery before you can set up a project as it looks quite intricate, I don’t know if my piece will be a sampler or a doodle cloth depends on how the piece develops. Thanks for sharing with us your thoughts on doodle cloth vs sampler and for the links above. Samplers as we think of them as a girls piece of needlework only go back in time to the 1500s. Prior to that time almost all embroidery was done by professional embroiderers for the Church or for royalty. The sampler as we think of it, as well as embroidery being something done domestically by women is a result of the Reformation. The early samplers were done for someone who was learning to stitch, not done by them. For example, a girl might get a sampler to learn from that showed her family crests so that she could learn to embroider them on family textiles. Spot samplers then came about where girls would practice their stitches and/or the designs they had to know. Girls would start to learn their stitches before the age of 5. As samplers continued in time the alphabet was added so that girls could learn same while they learned their stitches at the same time. In the 1600s and 1700s it became more common to add stitched pictures in addition to the rows of stitches and the alphabet. There are also darning and other types of samplers that were done. In around the 1830s, as more schools were started for girls in more places, and with the advent of Berlin work, girls were no longer learning their alphabet with their stitching and the sampler became less common and more of just a design piece to display in the house if they did one at all.